Chicken is something that I frequently turn to in my recipes. It’s simple and mild, so it’s easy to dress it up and not have the flavor of the meat overwhelm the entire dish. That’s not even counting that chicken will usually come on sale and chicken breast is a great way to keep the points low in recipes. The trouble with chicken is that, like veggies or anything else, it’s easy to get stuck in a rut. But I have an amazing, simple, easy and delicious way to dress up your chicken breasts! Enter this Chicken Pesto Bake recipe. 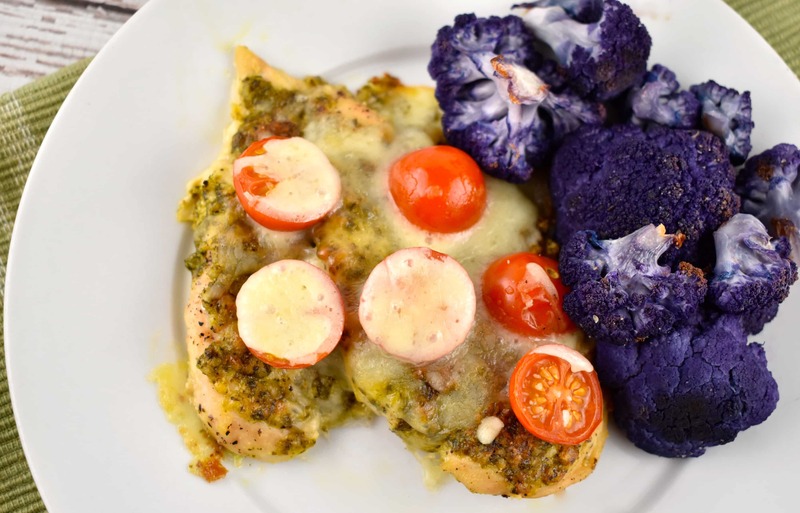 The chicken is topped with a flavorful pesto sauce, tomatoes and mozzarella cheese. It’s amazing. One of the best parts about this recipe is that it’s super simple. It’s only got 6 ingredients, and two of those are salt and pepper! All you need is some chicken breast, pesto sauce, cherry tomatoes and mozzarella cheese. Season with salt and pepper and you’ve got a delicious meal ready to go. Not only is this super simple with just a handful of ingredients, but it’s also quick and easy to prepare. With just 10 minutes of prep time and 25 minutes of cooking time, you’ve got your main dish ready to go in just over half an hour. And, you’re roasting the chicken for part of that time, so you’ve got the freedom to whip up some veggies and side dishes while your chicken cooks! If you’d like, you can make your own pesto sauce for this. I’ve tried quite a few pesto sauces over the years and some are better than others. It’s easiest for me to just keep a couple of jars on hand and use some of the premade sauce in this recipe. However, if you’ve got the time, make your own homemade pesto sauce and it’ll be even more delicious. Here’s a great recipe for a Low Calorie Pesto Sauce if you’d like to try your hand at making some fresh. This Chicken Pesto Bake calls for fresh cherry tomatoes, so summer is the perfect time of year to give this dish a shot. There is nothing quite like garden fresh cherry tomatoes – whether they’re from your own garden, the local farmers market or the grocery store. Fresh tomatoes that are in season are always juicier and sweeter. I love that I get to sprinkle on some reduced fat mozzarella cheese. I like to add some reduced fat cheese when I can. It helps me to feel like I’m not denying myself, not to mention the reduced fat has a better flavor than the fat free cheese. If you’d like to make this a little more authentic, find a reduced fat fresh mozzarella cheese to put on top. You’ll be blown away by the amazing flavor of it. My Chicken Pesto Bake is packed with protein, but it’s low in carbs. This means that if I have the extra points, I like to have it with some fresh Italian bread or serve it as a sandwich. Or, you can have it with a fresh side salad and some steamed veggies. It also works well with pasta or rice. This recipe is delicious, simple and versatile. The perfect way to dress up your chicken breast and have a delicious and beautiful meal without adding lots of fat and calories! A light and easy summer dinner recipe that’s bursting with fresh, bold flavors. It requires just a handful of ingredients, but delivers a delicious dish. Preheat oven to 400. Line a baking sheet with foil or parchment paper, and mist with cooking spray. Butterfly or slice chicken breasts to create 4 thin cutlets. Season each piece with salt and pepper. Spoon pesto sauce evenly onto each piece of chicken, and spread. Place in oven, and roast until chicken is cooked through, about 15-18 minutes. Remove from oven, and top each piece of chicken evenly with tomatoes and mozzarella cheese. Return to oven and cook until cheese is melted, about 5 minutes. For all of you who are looking for an easy way to print these recipes, but don’t want ads or want one page to print. *Holding down the left side of your mouse, highlight the entire part of recipe that you want, right click your mouse & choose copy. Open a clean Word, Works or other word processing software program. Now place your curser on the page and right click your mouse & paste the saved information. Now you can delete ads, cut unnecessary lines, make the font size smaller or larger. Learn how to edit your recipe by playing with it. You can always go back or re-paste it to start over. Remember when you have what you want to print & save it in a Recipes.docs file! Can’t find a print icon? You can copy and paste into a Word document and then print. It only takes a second. All you have to do is copy (Control C) and then paste (Control P) into a Word doc or whatever you use & then print. Recipes are formatted beautifully for this technique. Or you could even take a “screenshot” of the recipe and paste that into a doc!